The Madonna Embroidery – A mother’s love. In Christian imagery everything has a symbolic meaning; the colours, gestures, people and flowers. But to me, this is not firstly an image of Mary and Jesus, but an international symbolic image of a mothers love, and that’s what I’ve named the piece. A mother’s love. You can tell how strong and hot that love is – and how it radiates out of her like fire? The idea of creating an image of the Madonna and her baby came to me when I did my first interview for the Embroidery Guild’s mag two years ago. I got to take part of some images of very old embroideries taken at the Kunstgewerbemuseum in Berlin. I was very inspired by them. They were gorgeous coptic embroideries from the museum collection, all showing different Madonna images. The worn feel and the excellence in handcraft that they radiated really inspired me. Especially a thread bare embroidery, where you could actually see red flames coming up form behind the Madonna. It’s not a common imagery and I haven’t seen it elsewhere, but that image was really beautiful to me and I wanted to create my own version of it. I started this embroidery right away after the interview. 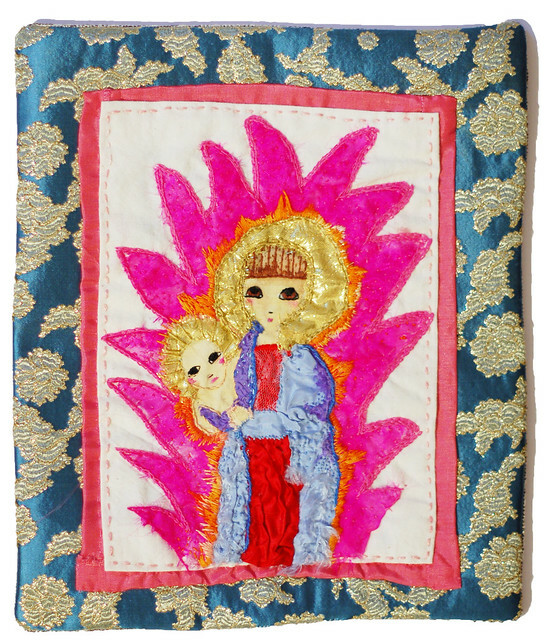 I also inspired my embroidery group to create their own interpretation of the madonna. I took a piece of white cotton and experimented with watercolours and applique. I actually did a quick sketch but did not have much of a plan. If I remade this image today I would do it differently, but as it is now, I’m quite happy with it. This embroidery has been in two exhibitions already (last year). I’ve decided to keep it, though I’ve put it away in my Christmas decoration box. I will enjoy it again in December, standing beside my big snow globe where a white angel is looking after the baby boy. I would love to know what’s your thoughts on this? This entry was posted in Fabric Art and tagged christmas, embroidery, inspiring me, symbols, traditions, watercolours. Bookmark the permalink. That is absolutely beautiful! I wish I could sew that well. The colors are absolutely gorgeous! Really nice Hanna, and I think your thoughts about a general love between mother and child is a good one. Who knows what Madonna was ment to represent from the beginning, might as well be the love from her to children. I really love it Hanna – I like the mix of fabrics, clear contrasting colours and the borders. You deserve to keep it and enjoy it each Christmas – it will become a tradition to get it out and set it up for display each year. Stunning! Beautiful! Brilliant! Gorgeous! Breathtaking! I completely love it! The design, the colors, the attention to details. You have inspired me greatly with this piece. Perhaps one day I will be able to create a Guadalupe embroidery. Such a sweet piece, and the colors are simply stunning. I love it Hanna. And, of course, I particularly love the way in which you’ve made an immediately recognisable religious icon by using the colour blue. Since time immemorial blue was associated with deity because the pigment was so rare and costly either to buy or create. I love the way in which limitations to art help us create something that is truly ever-lasting, even from a cultural perspective. Powerful- the mother’s love is powerful to me. The details in the stitching is stunning!